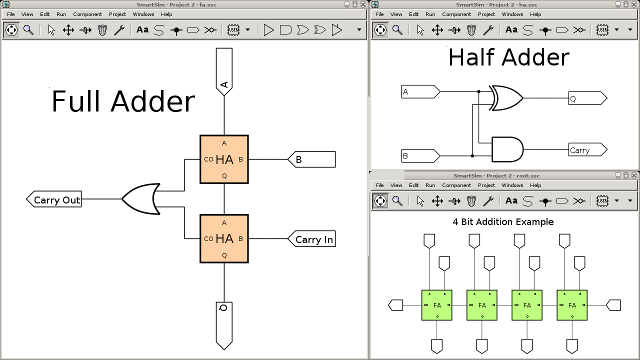 The orange components are actually instances of the top right (Half Adder) circuit. The left circuit (Full Adder) is used as the green component in the bottom right circuit. 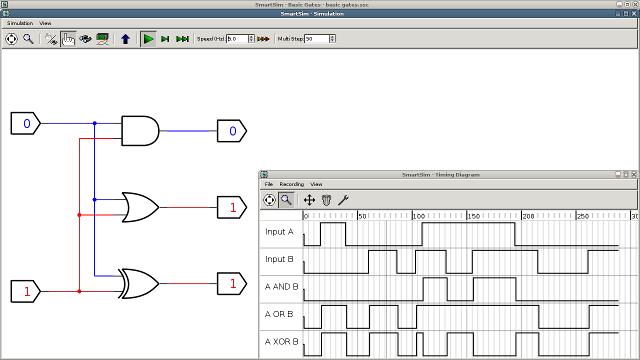 The timing diagram in the bottom right was produced from interaction with the simulated circuit. SmartSim lets you to create complex circuits by allowing you to create your own custom components and including them in other circuits, as if they were any other built-in component. These larger circuits can then also be included in other circuitry as sub-components. When you have finished designing your circuit, SmartSim offers an interactive simulation feature, allowing you to control your circuit and explore inside sub-components whilst the circuit is running. SmartSim also allows you to produce logic timing diagrams from your simulation's activity, allowing you to record and analyse your circuits function in detail. 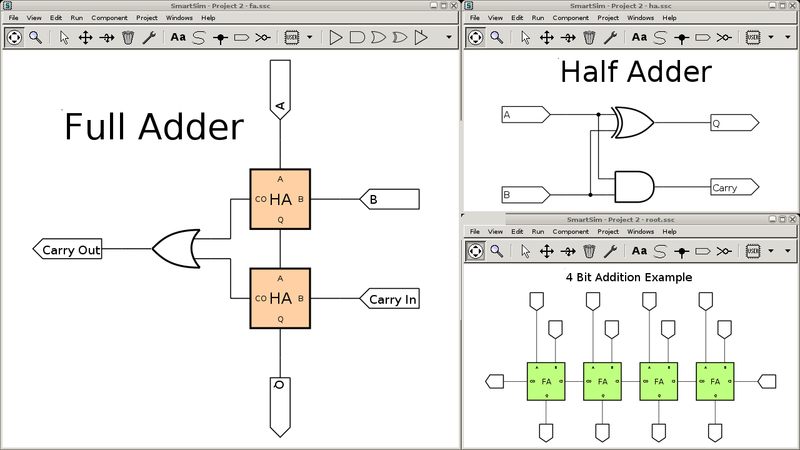 SmartSim offers the ability to print out or export your circuit designs to PDF, PNG, or SVG. Timing diagrams can also be exported to PDF, PNG, and SVG. SmartSim is almost entirely pointing device operated, making it ideal for use with interactive whiteboards in classrooms, and other touchscreen devices, with minimal dependency on keyboard interaction.